The Shamasne family, which resides in occupied East Jerusalem’s Sheikh Jarrah neighborhood, recently received an eviction order from the Execution Office of Israel’s Enforcement and Collection Authority. The order states that the family must evict its home by August 9, 2017, or else it will be forcibly removed by authorities. This order follows a Supreme Court verdict from August 2013, in which the court rejected the Shamasne family appeal, and ruled that family members of protected tenants do not inherit this status and, therefore, can be legally evicted by the owners of the property in which they reside. The recognized owners of the home in which the Shamanse family lives are a Jewish settlement organization which managed to establish its ownership over the property based on a clearly discriminatory implementation of recognizing such rights in Jerusalem only for Jews. This looming eviction of the Shamanse family is part of much broader plans undertaken by the Israeli government to establish Jewish settlements in Sheikh Jarrah. Only two weeks ago, four specific plans for new settlements in the neighborhood were submitted, plans which will change the demographic composition of the neighborhood and thereby intentionally create a major obstacle for a peace compromise in Jerusalem. For 8 years, thanks in part to public pressure, no Palestinian family has been evicted from its home in Sheikh Jarrah. “Now for the first time in a while there is a real threat of evicting the Shamasna family from its home. This current eviction might lead to a new wave of evictions of dozens of other families in the neighborhood. 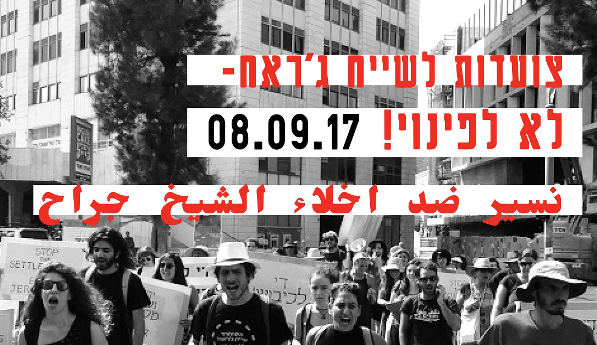 We must be there to prevent the eviction!” said a statement prepared by Israeli peace activists in Jerusalem. “The Israeli authorities are about to end their summer vacation and, with the close of the Muslim festival of Eid al Adha [this coming week], we can expect that the eviction will take place any day now. It is our duty to be present in the neighborhood during these crucial days. It is important to raise a loud and clear voice, in both West and East Jerusalem, against this eviction.